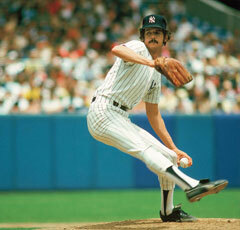 Ron Guidry made seven Opening Day starts for the Yankees, matching Whitey Ford and Mel Stottlemyre for most in franchise history. Interestingly enough, the first six resulted in losses for the Bronx Bombers, surely to the chagrin of owner George Steinbrenner back then. Finally, in 1986, Louisiana Lightning got the W in his seventh such assignment, a matchup against reigning world champion Kansas City and opposite starter Bud Black. Butch Wynegar’s three-run homer in the second was all Guidry needed, Rod Scurry had a huge hold over 2 1/3 innings, and Dave Rightetti preserved a 4-2 victory with the save for a crowd of 55,602. Sometimes Opening Day wins are curiously and confoundingly hard to come by for longtime aces, witnessed by CC Sabathia’s present run of Yankee openers, which would total six if he starts it in 2014. Even in Guidry’s debut of that majestic 25-win season of 1978, he finished with an unsatisfying result, dueling Jon Matlack in Texas but taking a non-decision when Goose Gossage gave up a ninth-inning homer to Richie Zisk. But looking back at ’78 now, all you remember is the greatness. There were the 18 strikeouts one June night against the Angels . . . There was the 25th win, an unforgettable one-game playoff at rival Boston . . .